Bourne apartment is part of an old farmhouse, Ferme le Grand Essert, in the pretty village of Entremont. Meet the owners over welcome drinks in the conservatory, and if you don’t fancy cooking, Carole, a keen cook, is happy to serve up delicious dinners in the cellar dining room. Note: linen, towels and cleaning included! NOTE that this rental might not be adapted to families with young children and people with limited mobility given the number of stairs and the very original setting of the apartment. Please contact us for more details. WHY IS FERME DU GRAND ESSERT - APARTMENT BOURNE SO SPECIAL? Bourne apartment offers traditional Savoyard style with a luxurious finish. Sleeping up to 8 (7 adults max) in four en suite bedrooms (all with televisions), the accommodation is set over two floors, so might not be ideal for those with young children. The living room, with its dining area and kitchen is set under the eaves on the top floor, offering stunning mountain views from the balcony. As befits an ancient farmhouse, the decor is very natural, with plenty of wood and quality soft furnishings. The shared sauna is on the first floor, and the jacuzzi out of doors on the ground floor, and in the winter, the wood burner in the conservatory keeps this space cosy every evening - it’s a great place to relax over a drink. In the summer, the heated pool is available for shared use in the large sunny garden - sunbeds, barbecue, chairs and tables are provided. The pool is not fenced in, but has an electrically powered safety cover for when the pool isn't being used. You can book both apartments for a group of 10-15, with a 10% discount on the second flat. Please note Essert Bourne is a semi detached apartment (split vertically and attached to Essert Aravis) on the first and second floors of a converted farmhouse. There are communal spaces on the ground floor and there is shared use of the swimming pool (May-October only), jacuzzi and sauna. There are sloping ceilings in the kitchen, dining area and living room of the apartment. The owner lives in the ground floor apartment. IMPORTANT : From 01/01/2019 the village of Entremont will start asking every(adult) guest to pay a city tax (taxe de séjour) of 1€ per night. NOTE: Free wifi. Cleaning, linen and towels included! OVO Network specialises in beautiful, hand-picked four and five-star properties that all offer something very, very special. Stunning locations, gorgeous interiors, fabulous facilities - only the very best properties can join OVO Network. Our aim, always, is to help you find your perfect holiday home. We visit and inspect every property and we meet the owners, giving us first hand knowledge that we share - honestly and in detail - with you. 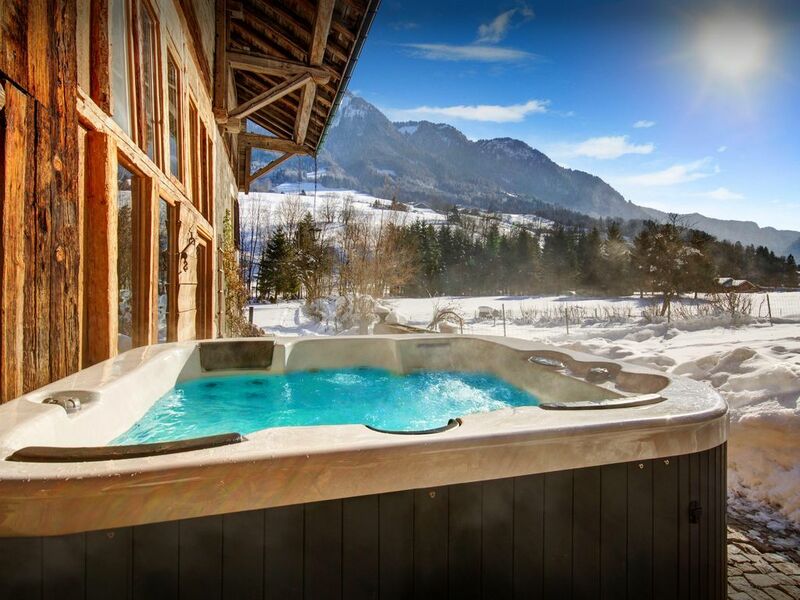 From stunning mountain chalets in the French Alps to beautifully styled country homes in Provence, over 48,000 guests have already found their perfect holiday home with OVO Network. Come and discover the OVO Network difference for yourself. * We hand-pick only the very best properties - every one has to meet our strict selection criteria. * We’ve visited and inspected all of our properties - we know them inside and out, so ask us anything and we’ll help. * You can be 100% certain that your property is genuine and waiting for you. * No nasty surprises - we give you honest, detailed information to help you find your perfect holiday home. We’d highly recommend this place to anyone! We’ve just returned home following a great weeks holiday. The chalet is stunning and beautifully decorated with everything we needed. It is situated close to the river in a stunning setting. It was lovely to take the short stroll into the village to collect fresh croissants for breakfast. Also within a short drive there are many great things to see and enjoy especially if you love being outdoors. We had brilliant trips to lake Annecy and Chamonix/Mont Blanc. Carole cooked two super meals for us and was so very helpful in making our holiday a truly memorable one. The pool and hot tub alongside the communal lounge and dining room were a real added bonus. We’d highly recommend this place to anyone! Thank you for everything. My family, which included three small children, had a wonderful time at the chalet. Carole met us at the time of check in and was on site for our entire stay to answer any question. The pool and hot tub were immaculately clean and everything you could want was provided: games for children and adults, toys and movies. We really thank the owner for such a wonderful stay! We loved every moment, the chalet, the location and the local area! Everyday we were swimming int he pool, hiking the mountains and enjoying a rose in the garden - a perfect summer holiday! We really appreciated the location, the environment, and our host. We loved the food, relaxing and doing many activities. It was our first stay in your beautiful lodgings and we were very satisfied with everything we found there. The house was charming and, at the same time, very well equipped. We had everything we needed. Carole, our "landlady" was very friendly and forthcoming and assisted us in every possible way. Her cooking skills were excellent and the meals very delicious. She provided us with any additional information we might require and she even gave us some very useful advice for our daily activities, whether we planned hiking trips in the mountains near the resort or attempted to "conquer" Europe's highest peak, the Mont Blanc at Chamonix. In all, our one week stay at Ferme du Grand Essert - Aravis / Bourne was a complete success! This, certainly, has not been our last trip to the beautiful resort in the beautiful French Alps! It was better than expected! We rented both apartments in this chalet, and it was the best we have ever stayed in. The comfort, the pool, the facilities — it was all perfect. It's also brilliant for the children and the setting was beautiful. Hope to come and visit you again one day! Thank you for an excellent stay in your beautiful chalet, your nice dinners and very friendly service. We loved the big garden, the nice pool, the cosy rooms, the privacy, the location, the nice little villages, the owners (!) and the views. Especially the bedrooms were very comfortable and nicely decorated. We love the mountains and all the activities that are around, walking, climbing, cycling, rafting etc. We and also our children look back with great memories!